Just like learning other arts, the road to learning to play the guitar can be fun, exciting and confusing at the same time. If you are not oriented early, you might develop bad habits that could affect your guitar life. So before you develop bad habits, you need to have a checklist in mind, of the things you must not do when you’re just beginning. To guide you, we’ve gathered the most common bad habits students tend to develop. The guitar isn’t the easiest instrument to hold especially for children. Mastering how to play the guitar can be challenging enough. Having a hard time holding one could even add to the difficulty. Here are some tips on how to properly hold the guitar. Grab your guitar and be take advantage of the curves of the guitar. The lower curve should be placed comfortably on your thigh and the upper one should be somewhere near your chest. While this doesn’t apply to everyone and every guitar, what you need to do is to be able to hold the guitar with ease so you could focus on practicing. 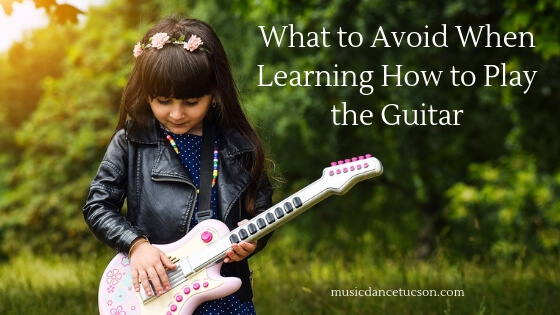 It’s pretty common for beginners to put in too much effort when strumming or picking the guitar, thinking that it needs to be strummed that way. This is a common misconception among beginners. Playing the guitar should feel easy. As a beginner, you need to have good ears. Even though tuning can be difficult, you have to get used to it. It’s one of the basic things you need to develop in the early stage of learning the guitar. The main point is to catch and correct even the simplest mistakes while you’re still learning. It’s important to establish good habits in order to gain skills to become the best guitarist you can be. Keeping this in mind will help improve your skills and enjoyment.